Well, the questionnaire was likely a big clue, but I went and joined the Knit 1 Tea 2 Swap. I have been knitting, but I've also been really busy so the knitting is glacial except for something I'm calling my Crazy Sweater which is mostly stockinette so the perfect unwind from an eleven hour work day, but I'm saving that one up. So. 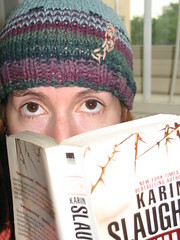 Karin Slaughter, author extraordinaire and, who knew, knitting enthusiast(well, okay, Crazy Aunt Purl knew, and probably others of you)had a little contest on her website. Knit a little something in honor of a famous serial killer and you could win. And we know I like the knitting, and the winning, and reading to. So, I knit up this hat using Sugar 'n Cream in and Midnight Magic Ombre (I think) and Soft Teal with a Jute accent.